OurCaste clothing is built tough, affordable and will last. Here is a breakdown of the essentials you see above. The Pete was developed to be your everyday staple pant. A superior tailored fit with 2% stretch for extra comfort in a classic chino silhouette. They used our staple white enamel key D Ring on the back belt loop along with our signature pattern printed waistband. The Bolton is our raglan sleeved, pigment dyed fleece crew. We developed this style to be an everyday grab and go piece with ultimate comfort in mind. The Harold is a panel blocked heavy weight jersey with Moisture Wicking Fabric Coating. The Steve is a pigment dyed crew neck top in super soft jersey with a front yoke welt pocket. 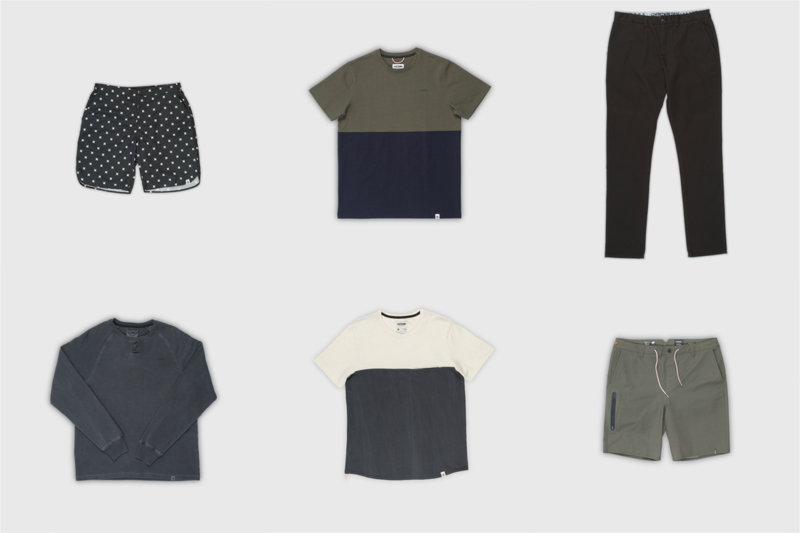 The Calvin is ode to the boardshort origins in modern fabrications. The Hybrid elastic waistband with button closure remind us of the cut of chino’s used back in the day. Side seam pockets leave room for your phone or cash if you’re out and about in these as well. The “Outfitters” are the solution for those on the hunt. Built for land, but at home in the water, they thrive in the elements. The fusion of the Roark detail and the ourCaste technical merit, the “Outfitters,” feature comfort fabric, internal mesh pockets, a waterproof zipper with internal pullout bladder pocket and an 18” out seam.